You bet. But there's more. MLM is a wonderful industry, but it has one ENORMOUS failing. New people do not get trained. They're like babies left in the woods. No hope of survival. If that is you, then we can help. I commit to you that we will mentor you to become successful & profitable in this business, no matter what company you are with. We'll train you to build BIG in Network Marketing with ANY MLM company. I'll personally train you & ALL your people on the phone, live & interactive, 5 nights a week. Phone call details CLICK HERE. You will learn EXACTLY, step-by-step, how to build a huge residual income with any company. You get it all FREE! Our conference calls NEVER mention a company name. We NEVER say a product name. I train you to NEVER close a sale. I train you to NEVER recruit. But you will learn how to build a huge residual income. People I respect have told me I'm nuts to give this all away. Ah, well ... no one's perfect. MentoringForFree.com exists because to feel good about myself, I need to help others be successful in MLM. Nothing else does it for me. Linda & I failed forward for 12 years before I found my own MLM mentor. This man has made many, many MILLIONS of dollars in network marketing. He once recruited 100,000 people in just over 2 years ... back BEFORE the internet days! I've read every one of his books, listened to every one of his tapes. He has spent countless hours over 14 years, tutoring me one-on-one ... even when I wasn't in his company and hadn't joined his downline. This man is a mentor with a servant's heart. He is a shining beacon of what you and I can be. My goal is to help YOU, just as Tom "Big Al" Schreiter has helped me. If I can do that, I'll be happy. Who knows? Maybe some day, you & I WILL wind up working together. Don't say ONE doggone word to family & friends! Build People. People will build your business. That's what I've learned, and that's my advice to you. Look for someone who is looking for you. THEY will build your MLM business. Once you're rocking & rolling, THEN go back and pick up family & friends. We've been mentoring ANYONE in network marketing for free for more years than I can remember. 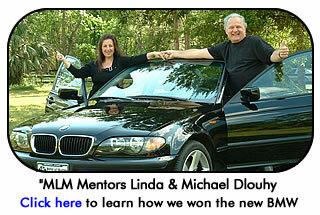 Linda & I have been in MLM 26 years, full-time since 1991. I spend 7-10 hours a week teaching everybody - even my COMPETITORS - every secret I know. The Heavy Hitters will tell you it's all crazy. But you know what? I don't care. It makes me happy. From a strictly business point of view, it works. When I freely give everything I know, my business & income build. Above all, remember this: MLM is NOT a sales business. It is NOT a recruiting business. For long-term success, you should NEVER promote to friends & family. This website is not about me. It's about you. And it's about people who inspire me, people who are now succeeding after years of network marketing failure. Read their stories. Let them inspire you, too. Hope you'll join us on the training calls. Want your OWN lead-generating Mentoring For Free website? Click here for details.